The Institute for Informatics and Automation Problems (IIAP) is the leading research and technology development institute of the National Academy of Sciences of the Republic of Armenia (NAS RA) in the sphere of applied mathematics and informatics, as well as application domain of computing technologies in various fields of science and technology. Since the foundation in 1957 (initially it was the Computer Centre of NAS RA and Yerevan State University), IIAP has played a remarkable role in Armenia through dissemination of culture in the fields of computer science and its applications. Computer Science and applied mathematics are among the main scientific directions of IIAP. Investigations in this area were started in early 50s, when Soviet Armenia has been a main hub of USSR’s critical scientific and R&D activities in mainframe and industrial computing, software development, etc. Scientific schools were created in IIAP in the main areas of computer science and applied mathematics in close collaboration with world-known scientific institutions of Russia, Ukraine and other countries. At present the theoretical researches in IIAP include mathematical logic, theory of algorithms, theory of automata, algebraic coding theory, artificial intellect and cognitive models, discrete mathematics, graph theory, image processing, information theory and statistics, and numerical methods. Currently, IIAP takes the leading position in the region in the field of ICT – the major technological scientific direction at IIAP. IIAP designed and created the Academic Scientific Research Computer Network of Armenia (ASNET-AM) and now it is responsible for developing and managing of the infrastructure. Currently ASNET-AM consists of communication nodes in 5 cities of Armenia, which are interconnected by fibre-optics and wireless links. Scientists, scientific and technical associates, postgraduates, students from more than 65 organizations currently constitute the ASNET-AM network. Since 1997 the biennial Computer Science and Information Technologies international conference organized by IIAP, is an important event in scientific life of Armenia contributing to the development of contemporary branches of informatics in Armenia. 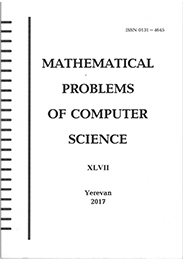 Since 1963, IIAP has published “Mathematical Problems of Computer Science”, transactions of scientific researches. The transactions include scientific investigations of IIAP researchers, as well as investigations of collaborating local and foreign authors. So far 44 volumes have been published. IIAP is engaged in training of high-level IT specialists. The leading staff of IIAP teaches in higher educational institutions and universities as well as supervises PhD (graduate) students. Since 2004 the master degree school has been established. It is affiliated with the International Scientific Educational Centre of NAS RA on specialization “Computer Science”, where IIAP professionals conduct teaching. IIAP co-operates actively with scientists from different countries within the framework of scientific projects supported by EU FP, UNDP, CRDF, ISTC, NATO and others.